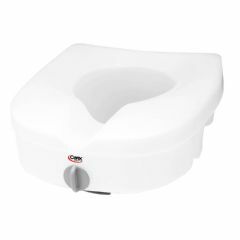 Easy-to-use locking mechanism secures the raised seat to the toilet bowl. The smooth contour seat has built-in handgrips for easy handling and is lightweight and easy to clean. AllegroMedical.com presents The E-Z Lock Raised Toilet Seat. Easy-to-use locking mechanism secures the raised seat to the toilet bowl. The smooth contour seat has built-in handgrips for easy handling and is lightweight and easy to clean.